DONETSK, Ukraine -- Some Russian soldiers are quitting the army because of the conflict in Ukraine, several soldiers and human rights activists have told Reuters. A fighter with the separatist self-proclaimed Donetsk People's Republic Army sits atop a Russian tank at a checkpoint in Ukraine. Their accounts call into question the Kremlin's continued assertions that no Russian soldiers have been sent to Ukraine, and that any Russians fighting alongside rebels there are volunteers. 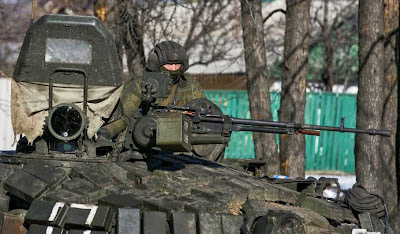 Evidence for Russians fighting in Ukraine—Russian army equipment found in the country, testimony from soldiers' families and from Ukrainians who say they were captured by Russian paratroopers—is abundant. Associates of Boris Nemtsov, a prominent Kremlin critic killed in February, will tomorrow publish a report that they say will contain new evidence of the Russian military presence in Ukraine. Until now, however, it has been extremely rare to find Russian soldiers who have fought there and are willing to talk. It is even rarer to find soldiers who have quit the army. Five soldiers who recently quit, including two who said they left rather than serve in Ukraine, have told Reuters of their experiences. One of the five, from Moscow, said he was sent on exercises in southern Russia last year but ended up going into Ukraine in an armored convoy. "After we crossed the border, a lieutenant colonel said we could be sent to jail if we didn't fulfil orders. Some soldiers refused to stay there," said the soldier, who served with the elite Russian Kantemirovskaya tank division. He gave Reuters his full name but spoke on condition of anonymity, saying he feared reprisals. He said he knew two soldiers who refused to stay. "They were taken somewhere. The lieutenant colonel said criminal cases were opened against them but in reality—we called them afterwards—they were at home. They just quit." Russia's President Vladimir Putin has repeatedly denied that Moscow has sent any military forces to help rebels in eastern Ukraine, where clashes and casualties persist despite a ceasefire struck in February. Putin's spokesman has derided such allegations by NATO, Western governments and Kiev. 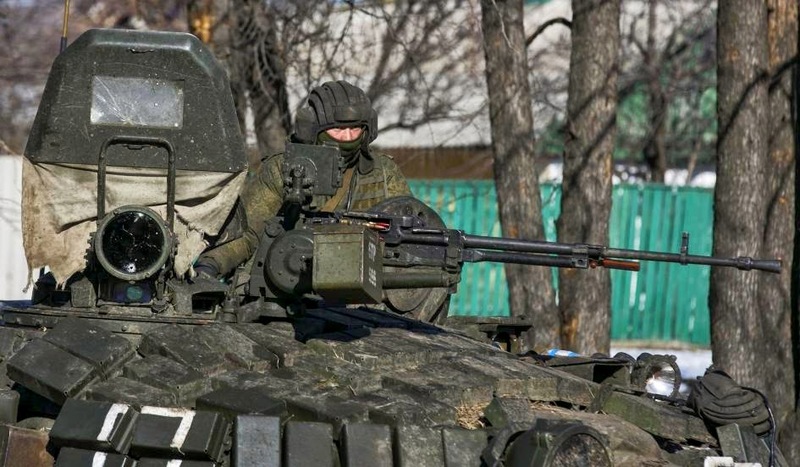 Officials say that any Russian soldiers fighting in Ukraine are "volunteers," helping the rebels of their own free will. The former Russian soldiers who spoke to Reuters, as well as human rights activists, said some soldiers were fearful of being sent to Ukraine, were pressured into going, or disgruntled at the way they were treated after fighting there. The former tank soldier from Moscow said he would not have gone to Ukraine voluntarily. "No, what for? That's not our war. If our troops were officially there it would be a different story." He said he had been sent to fight in Ukraine last summer and returned to Russia in September when the first peace talks took place. His crew operated a modernized Russian T-72B3 tank, he said. "[Back in Russia] we were lined up and told that everyone would get a daily allowance, extras for fighting and medals," he said. But he said that they did not get the extras they expected. "We decided to quit. There were 14 of us." The names of nine soldiers who quit the Kantemirovskaya division are mentioned in an exchange of letters between Viktor Miskovets, the head of the human resources department of Russia's Western Military District, and Valentina Melnikova, who runs the Alliance of Soldiers' Mothers Committees, a group based in Moscow. In the letters, seen by Reuters, human rights workers asked Miskovets to approve the soldiers' resignations—which one soldier told Reuters the military had been unwilling to do. The letters do not mention service in Ukraine. The soldiers left the service on December 12, according to a letter signed by Miskovets. He and his deputy did not answer calls. Three soldiers from the list, contacted by Reuters, confirmed they had quit the service recently but declined to discuss Ukraine. A spokesman for the Ministry of Defence declined to comment on soldiers quitting the tank unit or being sent to Ukraine. In Russia, all men aged between 18 and 27 have to serve 12 months in the military. By law, these conscripts cannot be sent abroad. But according to human rights activists, military officials have been promising conscripts financial incentives to sign contracts that make them professional soldiers. The officials then push the soldiers into going to Ukraine. Sergei Krivenko, head of a rights group called "Citizen. Army. Rights" and a member of a human rights council created by the Kremlin, has dealt with soldiers' rights since the early 2000s. He said military commanders are trying to find more people who will go to Ukraine voluntarily, "but this is still 'volunteers' in quotation marks, because there is harsh pressure." They offer large financial rewards to contract soldiers willing to go to Ukraine. If soldiers refuse, they are told to resign, he said. "You can't criminally prosecute someone for not following the order, because the order itself doesn't exist on paper. It's only oral." Since 2012, contract soldiers' pay has risen, said Krivenko, who traveled to Murmansk to meet soldiers, about 30 of whom told him they had been to Ukraine. "Now they receive 20, 30, 40,000 rubles a month depending on their rank. Some even get 60,000 a month." The average wage in Russia is about 30,000 rubles ($580). "Just like others in Russia, they're paying off apartments, foreign-made cars.... The question becomes where do they find the money to pay off debts, to feed their families?" Reuters could not independently verify Krivenko's account. A spokesman for the Ministry of Defence declined to comment on Russian involvement in Ukraine, but Putin has made his position clear. "I tell you directly and definitely: There are no Russian troops in Ukraine." Another soldier who said he quit the army over the Ukraine conflict is a 21-year-old who was a member of a Grad missile unit. The soldier, who asked that he and his unit not be identified, told Reuters that in the summer of 2014 his team took up position about 2 km (one mile) from the Ukrainian border in the Rostov region of southwest Russia. The operation appeared to be an exercise, though the men were ordered to prepare as if for real combat. "We drove there without insignia. We took off all the buttonholes and stripes. We were told that we did not need them in field conditions." In early September the men were ordered to fire their rockets at a target "about 17 km" away, "maybe less." It was possible the target was in Ukraine, he said. "I was hoping I did not aim at any people. Or at least that I missed the target." He said his fellow soldiers told him another battery from his unit had crossed the border and spent 10 days in Ukraine. "I did not understand who was fighting and what for, and the point of it," he said. While on leave in January, the soldier said, he was unexpectedly summoned back to his unit. "We were moved to another [artillery] battery that was supposed to go to some exercises in Rostov region. They said they were really big exercises and very big forces were involved," the soldier said. Although he offered no proof, he said he had no doubt it was related to the conflict in Ukraine. "Of course it was. Why else would we be called off from vacation?" He and four others decided to quit the army rather than risk being sent to fight in Ukraine. After completing the necessary procedures, they left in March, according to the soldier's account and documents from human rights activists and military prosecutors. Most Russian soldiers who fought in Ukraine last year—whether volunteers or not—came from Central Russia, the North Caucasus or the Volga region, according to soldiers' accounts, relatives and Russian media. More recently, Reuters reporters in east Ukraine spotted fighters from Siberia, thousands of miles away. Their appearance lends support to claims that Russian troops from regions closer to Ukraine have become reluctant to join the conflict. Early this year Asian-looking fighters were seen maneuvering armored vehicles and manning checkpoints in Donbass, eastern Ukraine. The fighters turned out to be Buryats, a Mongolian ethnic group from Russian Siberia near Lake Baikal, about 4,500 km from Ukraine. Dorjo Dugarov, a politician from Buryatiya, a region in southeast Siberia, said a Siberian soldier who had returned from Ukraine had told him that "people from the western part [of Russia] didn't want to go. Their morale has fallen." Yevgeniy Romanenko, a 39-year-old rebel fighter in east Ukraine, told Reuters that during battles near Debaltseve in February he drove a truck in a convoy that was accompanied by two tanks with Buryat crews. The tank crews provided cover for the truck convoy. "One of them drove in front of the convoy and the second one behind," Romanenko said at a hospital in Yenakiyeve, where he was recovering from shrapnel wounds to his leg. "Yes, that's for sure. The guys were from there. It was clear." In February, a Buryat soldier also appeared in an interview on a TV station in eastern Ukraine. Popular singer Iosif Kobzon, who is a member of Russia's State Duma, the lower house of parliament, was filmed visiting injured fighters in a hospital in Donetsk, eastern Ukraine's biggest city. Kobzon says he spoke to a soldier who said he was a member of a tank crew from Buryatiya. The Russian independent newspaper Novaya Gazeta later identified the soldier as Dorji Batomunkoyev from military unit 46108 based in Ulan-Ude, the capital of Buryatiya. Rebels in Ukraine said the Buryat were not soldiers sent by Russia but volunteers. "We have volunteers from the Russian Federation," Vladimir Kononov, the Ukrainian rebel defense minister, said in early March. "This tankman could have left the army before he came here." Reuters could not reach Batomunkoyev. His mother Sesegma, contacted by telephone, confirmed that her son had served in the army and been injured in Ukraine. She visited him in a hospital after he was transferred back to Russia. She declined to say whether he had been ordered to go to Ukraine or had volunteered. "He did not say he was going," she said. "He called me on February 19 and shouted 'Mum, I got burnt in a tank.' And that's it."